Are there real-life “Rain Men” who actually walk among us? And just what is a Rain Man, anyway? If we can agree it is a generally hopeless person, who is still able to do one thing, and only one, superlatively well, then, yes, it can be said that there are real Rain Men. Let’s take a quick look at just, who, back in the 80s, might have served as inspiration for the now world-famous movie character that Barry Levinson created. Michael Richards–“Kramer” is apparently so golshdarn funny they paint oil portraits of him. It’s a shame the person who portrayed him is so maladroit in nearly every other phase of his existence, up to and including stand-up comedy. Joe Piscopo–His Sinatra imitation was impeccable. When he’s not doing that, he’s about as charming as the guy slipping roofies to your sister on her L.A. vacation. Oliver North–Had a sharp eye for picking attractive secretaries. Not entirely certain what other purpose he served. 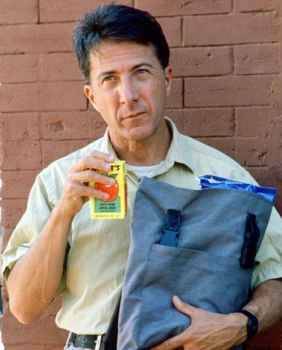 When original casting choice David Byrne dropped out of the project after only one week (citing “religious differences” with co-star Tom Cruise) Dustin Hoffman stepped in. And he ran with it–all the way to the Oscars, where, unable to break character, he dropped the statuette on his big toe and fell into the large Japanese Temple-shaped cake that had been baked to commemorate Akira Kurosawa’s Lifetime Achievement award. All whilst cawing “Don’t burn the baby!!! !” like a deranged mynah bird. Of course not–what kind of person would scald an innocent baby? ?